National income continues to be closely linked to personal life satisfaction at the country level. 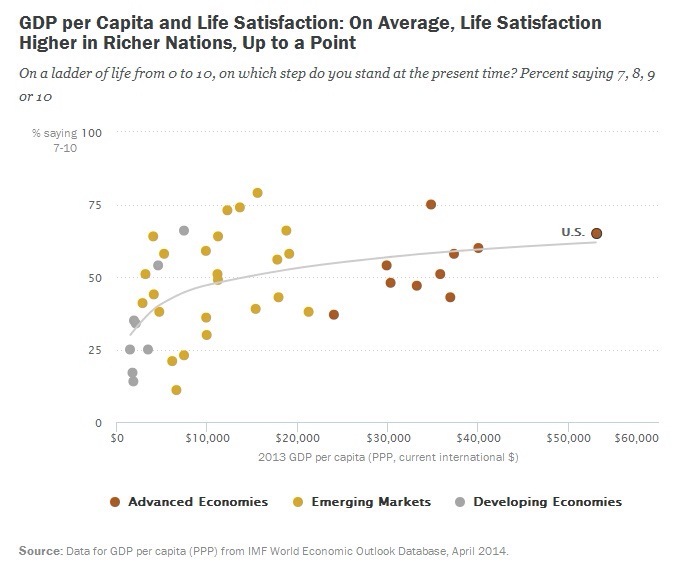 Richer publics, on average, report being happier… However, the advantages of being in a rich nation tend to taper off among the wealthiest countries, suggesting that after a certain point, increasing income does not make as much of a difference in life satisfaction. There are all sorts of interesting takeaways from just this one chart alone. One is that how the economy is doing — not just the level of income but things like unemployment, wage growth, etc. — appears to make a big difference in how people feel about their lives. It’s not surprising that European countries, which are generally wealthy yet basically stuck in an economic depression right now, tend to be less satisfied than their income levels would suggest otherwise. Spain, for instance, which has a youth unemployment rate of about 50%, saw the percentage of satisfied people decline most sharply over the past few years. But the other takeaway for me, and something people don’t talk about enough, is this: People in very poor countries are miserable. We’re not talking about Mexico here, where the satisfaction rate is 79%. In some Sub-Saharan African countries, for instance — Kenya, Tanzania, Uganda, Ghana — the rate is less than one third. This flies in the face of the romanticized Western image of life in the developing world, where people are poor yet happy and content to live a purer, simpler lifestyle. Wrong: People in poor countries really are more miserable than we are. [T]he happiness and greatness, the rank and station, the pleasure and peace, of an individual have never consisted in his personal wealth, but rather in his excellent character, his high resolve, the breadth of his learning, and his ability to solve difficult problems. [I]ndividuals with more key household goods are happier than those with fewer of these goods. The survey asked respondents whether their household had each of the following nine items: a television, refrigerator, washing machine, microwave oven, computer, car, bicycle, motorcycle/scooter and radio. The more items a person has on this list, the happier they tend to be… The difference is significant in 37 of the countries surveyed, and again, the magnitude of the gap is 10 percentage points or higher in most countries. An element of spirituality is to recognize life’s deeper purpose, while acknowledging the relative triviality of material things. But another element of spirituality is to care for the material wellbeing of others. The world’s poor deserve better; what spiritual truth could be clearer than that? This entry was posted in Economics, Wealth and poverty and tagged 'Abdu'l-Baha, happiness, international development, Pew Research, poverty. Bookmark the permalink.